You must live in a cave in the mountains without any wifi or ISP service to have missed the news about the new IPCC report on Climate Change. Every news outlet picked it up yesterday but today it’s gone. In using the Microsoft News app on my PC just now I had to scroll down many times to find it and even then it was only in my customized content did an article by Men’s Journal come up. It’s short and sad. See why I don’t keep up this blog much anymore? It’s useless. Even the people who believe, who know it’s happening and fear the consequences… they’ll do nothing. They will not do one thing differently. I only told two people about the news and one of them chewed me out for it. Why would I add to their stress, they wanted to know. They’re already paying twice what they should in utilities because they’re buying green energy. They’re already saving by driving a smart car. What else can they do?! It’s a fair question. Our society holds you in the grip of the status quo. If you were to quit your job, leave an urban area, establish a sustainable community, and throw yourself into activism for making a significant change – our government would label you an ecoterrorist. You’d be anti-social. You’d be like the family of Ruby Ridge. So even people who believe it is very possible that global climate destabilization is happening and will get nearly exponentially worse can do nothing more than freeze in fear and indecision. Like deer in the headlights of an oncoming tractor trailer. 1,644 dengue cases report in city this year, 488 fresh cases last week – in New Dehli (it may possibly be the littlest amongst us that brings us down). Warming oceans causing rise in venomous sea creatures – and then there’s this. 2100 – Beyond the UN Climate Change Report: MIT Predicts Earth’s Point of No Return – M I T!!!!! Like WTF! * tap tap tap * is there anybody out there? Seas Could Rise 8 Feet by 2100 Without Urgent Action to Curb Climate Change – I think much faster than that. But, and I don’t know if this is true for you too, most all anyone I know want to talk about is how Trump has now said Kavanaugh was proven innocent at swearing in or that Roxanne is missed by The Connors. Still posting on TWITTER… link below. 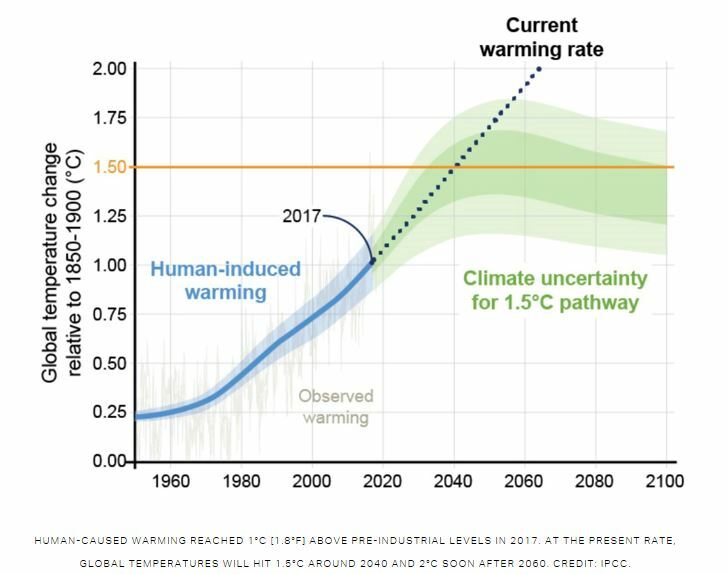 These ideations about “2100” or keeping the warming at “1.5°C” are unrealistic. Even your graph above seems on the conservative side. I’m starting to think McPherson is closer to the probable timeline than his critics believe. First, emissions are increasing. Second, the financial musical chairs game is going to end badly and soon. Then commerce stops churning. Construction halts, airplanes are grounded, then the particulates fall out of the sky and the temp ratchets up 2-3°C. Feedback loops kick in… the end.